Following a narrow movement in sugar prices, mills are banking largely on ethanol to improve their financial health and remain afloat in business. Oil marketing companies (OMCs) have issued a tender for procurement of 485 million litres of ethanol from ‘B’ heavy molasses and 18.4 million litres from sugarcane juice for the current sugar season beginning October 2018. This additional tendered quantity is likely to result in diversion of 0.5 million tonnes of sugar into ethanol in addition to the existing quantity directly procured from molasses generated automatically from cane crushing. 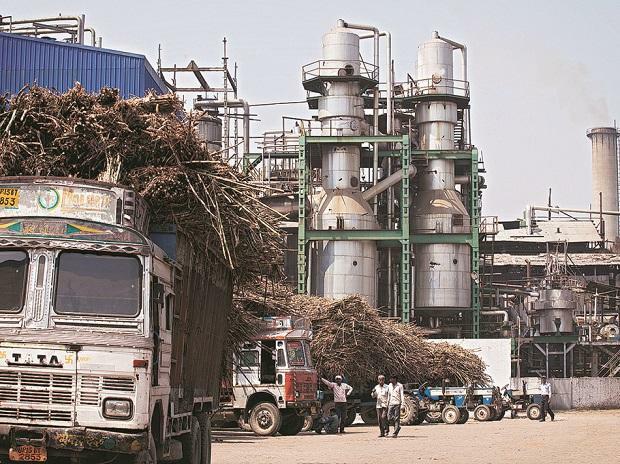 Apart from the additional quantity of ethanol production and sale, the price increase by the government has helped mills increase their top line and bottom line in December 2018 quarter and is also likely to continue supporting them in future as well. “The benefit of upward revision in ethanol prices by the government, with effect from December 1, 2018, to Rs 43.46 a litre should be seen from January–March 2019 and fully during the financial year 2019-20. Profitability from this segment would increase in the financial year 2020 due to the benefit of higher prices and also higher volumes,” said Abhishek Roy, an analyst with Stewart & Mackertich Wealth Management Ltd, a Kolkata based research and advisory firm, while analyzing Q3 financial performance of Balrampur Chini Mills (BCML). Average realisation from ethanol stood at around Rs 37.5 a litre last season. Leading sugar mills in the country such as Dwarikesh Sugars, BCML and Dhampur Sugar Mills have reported improved revenue generation from distillery segment backed by lower input costs and higher volumes. Greenfield expansion in sugar mills’ distillation capacity is in various stages of completion which would help them further to ramp up their realization from this segment. In fact, the Cabinet Committee on Economic Affairs made 5 per cent of ethanol blending mandatory with petrol for 2013-14 and 10 per cent thereafter. Since then, however, the government has been encouraging sugar mills to increase their ethanol production but, even 6 per cent blending has become impossible to achieve even today. 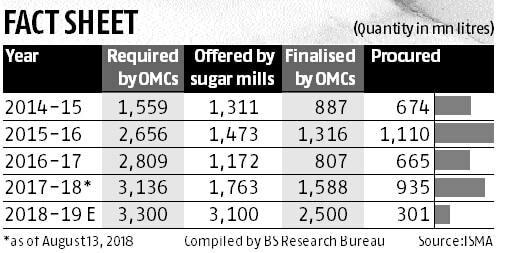 Data compiled by the apex industry body Indian Sugar Mills Association (ISMA) showed, OMCs require 3,292.61 million litres of ethanol for blending with petrol of which sugar mills offered 3,137.32 million litres. OMCs finalised a tender to lift 2,593.37 million litres of which just 11.61 per cent or 301.10 million litres has been supplied so far. Bhavesh Gandhi, an analyst with Yes Securities, believes that BCML reported robust 30 per cent and 5 per cent increase in distillery volumes and realization respectively, support from central and state government efforts to cap cane costs offset the fall in sugar realisation. “While inventory situation is yet to improve, prospect of lower output next year leads us to believe that worst of sugar glut may be behind,” he added. A senior official of one of the largest ethanol supplying companies said that the fall in realization from sugar has not only compensated through an increase in the volume of ethanol but also added much to the mill’s revenue in December quarter. Further, price increase from December 1 to cushion sugar mills’ revenue and profit further, he added.